Image Size: 24"w x 15 3/8"h.
As the Christmas season draws near, we find ourselves reflecting on who we are and how much our family, friends and freedom mean to us. Our hearts wish that the joy of the season could last all through the year. 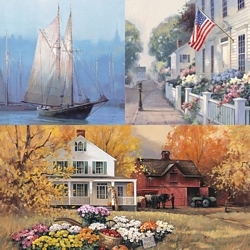 The winter scenes of Paul Landry have long been a welcome holiday staple in the Greenwich catalogue. We are pleased to share with you one of his most romantic and enchanting seasonal images. The children sledding, bringing home the tree and a sleigh carrying presents home to the delight of any child, all provide a nostalgic reminder of the many sights and sounds of the holiday.